Students And Families for Education (SAFE), a newly-formed coalition of San Leandro parents, students and community members, will hold a rally on Tuesday, December 9th at 6pm, outside San Leandro City Hall. The rally will take place before the San Leandro School Board meeting at which the Board will vote on whether to divert hundreds of thousands of dollars from school classrooms towards paying police officers’ salaries. SAFE opposes the use of any school funds to pay for law enforcement. “San Leandro schools have been underfunded for years, class sizes have gone from 20 students to 28, and school counselors have been practically eliminated. The idea that we should be using limited resources to pay for police is simply outrageous” said Cynthia Chandler, a parent and co-founder of SAFE. 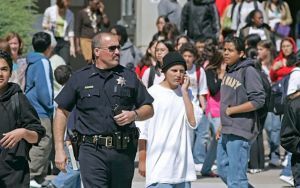 Earlier this year, the San Leandro Police Department applied for a $500,000 federal COPS grant to fund four police officers to be placed at San Leandro schools for four years. To the surprise of the community, the San Leandro police department asked the San Leandro Unified School District (SLUSD) to divert $1.7 million from its educational budget to “match” the funds from the grant. After negotiations with the City of San Leandro, the Superintendent brought to the Board a proposal that the City and School District split the cost of the grant, diverting $600,000 per year from the classroom. San Leandro High School currently has two school resource officers paid for by the City. According to Cathy Pickard, a recently-retired resource officer, most of her time was spent counseling students. “There is general agreement in our community that San Leandro students need as much access to qualified counselors, nurses, social workers, and other district staff who can help them with academic problems, the effects of poverty and homelessness, family violence, social pressures, and many other obstacles to their potential for success in school and in life. Despite their good intentions, most police officers do not have the specialized training necessary to properly attend to these needs. School counselors and other staff, moreover, receive much lower pay than sworn officers. Approximately two counselors can be hired, trained, and compensated for the cost of one school resource officer,” said Mark Hamilton, a counselor at Bancroft Middle School and SAFE member. Washington Elementary student Oscar Ivy asked the San Leandro School Boards to fund school supplies, not cops. “We invite parents, students and community members to join us on Tuesday to let the School Board know that we need to put education ahead of incarceration. 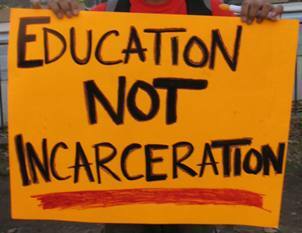 We should be striving to educate, not criminalize our youth,” said Chandler. Anyone opposed to the COPS grant is also encouraged to speak at the School Board meeting, which starts at 7 PM, and/or to e-mail the School Board. The rally will take place in front of San Leandro City Hall, on Tuesday, December 9th at 6pm. For more information, press inquiries, please contact Cynthia Chandler at (510) 325-4127 or Mike Katz-Lacabe at 510-207-7165. The following are tweets from last night’s San Leandro School Board meeting, made by parent Mia Ousley (@Mia4Council), who is currently running for City Council District 5. The SLPD applied for a $500K COPS grant to put four resource officers in San Leandro schools. In return, the district would have to pay $1.7 million dollars, and cut programs accordingly. In addition to the people quoted below, several other parents and several teachers/counselors/nurses also spoke out against accepting the grant. The student trustee – who does not get a vote – did so as well. Only Board members Diana Prola and Ron Carey spoke in favor (but see comment below). Any parent who is concerned about using education money to fund police officers and/or has an opinion on what educational programs should be cut/not restored in order to pay for them, should speak out at the Nov. 18th School Board meeting and e-mail the Board. Evelyn Gonzalez approves of School Resource Officers, just asks for city to foot most of the bill. Jessica Sievert – Mom of kindergardener, our work is to help change trajectory of at-risk youth so we don’t need police in schools. Feels district is being forced to pay, district’s hand is being twisted. Feels politically inappropriate way to allocate money. Any funding for students should not be pulled from other education resources to fund this. Cynthia Chandler — Letter from district said Bancroft so deficient that parents have right to transfer out of district, so why spend money on police rather than on getting resources needed in classrooms and for teachers. Liz Torres – 3 kids in 3rd, 6th, and 12th grade. We need safety and resources in schools, not more police. $1.69 million should go to programs that uplift and inspire our children and prevent violence, not react to it. Policing campuses is wrong direction and is misuse of our funds. After-school programs are what we need more of, what helps kids. [School Board Trustee] Mike Katz-Lacabe – We have 1.8 nurses for 8800 students, this will prevent us from restoring cuts made in the past. Doesn’t want to establish a precedent for the district funding SROs, outstanding Cathy Pickard notwithstanding. Yet to see data showing SROs increase safety. Anecdotes are not evidence. How many of our students get arrested instead of receiving school discipline and what is their racial make-up? We (the school board) should NOT approve this grant. (2) Hiring police to do job of counselors is harmful to students, and expensive to district. (3) $1.7 million over 4 years is $106,250/year/officer . . . seems we’re paying MOST of their cost, not just some. (4) Police shouldn’t help run student groups or after school programs, as the grant requires. (5) Adding police to schools sends message that we expect kids to get into trouble. (6) District should instead be teaching non-violent communication, implementing restorative justice, and hiring trained counselors. And finally (7) It’s shameful this issue didn’t come before parents BEFORE SLPD applied for grant & BEFORE City Council voted on it. Motion tabled ’til Nov. 18 meeting. Board President [Lance James] wants to give supporters a chance for public input to counter tonight’s public speakers. My opponent for City Council [Corina Lopez] was the only Trustee not to speak on the issue at all; perhaps she didn’t want to say anything controversial? 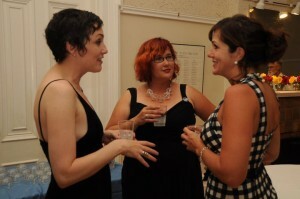 Cynthia Chandler (left) and other former Cassidy supporters at the Swing the Vote for Cassidy fundraiser in 2010. The following open letter was left by San Leandro resident Cynthia Chandler on Mayor Stephen Cassidy‘s Facebook page. Chandler was a strong supporter of Cassidy during his 2010 Mayoral campaign but has grown frustrated with the Mayor’s unwillingness to lead. 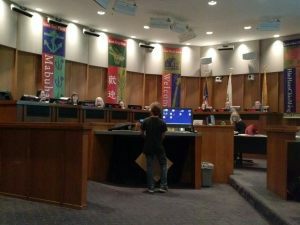 After attending a town hall meeting where the Police Chief gave misleading information and the Mayor disallowed continued discussion of city issues, Chandler wrote an open letter asking that Mayor Cassidy limit the power of the Chief to write ordinances. Cassidy responded saying that he would, but otherwise praising the Police and saying that his major interest was in re-negotiating the pension obligations for firefighters. This is Chandler’s response. Wonderful to hear Mayor Cassidy supports an ordinance to limit abuse of police power by disallowing police from drafting city policy/ordinances. I look forward to seeing how you push this important effort. Thank you! Regarding the city’s public safety budget, thank you for breaking down resources spent in the general fund. I would appreciate a list of expenses outside of the general fund spent on policing. Also, I do not support efforts to attack firefighter’s pensions. Firefighters have a radically reduced life expectancy as result of secondary illness brought on by exposures to toxins while fighting fires. Every day, their job risks their health and livelihood into the future. I do not think it is appropriate to build a budget on the backs of working people. Similarly, that our city’s budget was balanced significantly through passage of a sales tax through Measure Z, which by definition, as a sale tax, disproportionately impacts people with lower economic standing, is not acceptable to me as a long term solution (and thank you for opposing that tax). Nor was it acceptable for me to read in the San Leandro Times that the majority of the Measure Z tax money went to policing at a time when overall crime is low, yet our other essential safety systems, such as roads, economic development and schools are underfunded and in disrepair. Of course, as you point out in response to my ask that you support a marijuana tax designed to fund some of our underfunded public safety needs, no one incomplete source of funding will provide us all we need to better all these neglected safety structures. That is why we need to diversify with multiple sources of income locally, and not dismiss one source as incomplete. However, in that work, I hope that you do not continue to focus on attacking the base needs of workers–how about assessing reform to our commercial tax codes in ways that will benefit small business but perhaps add tax to large box stores and other larger businesses? Concern for diversification also is why I asked you and Council Members what you are doing to build collective power among municipalities to demand from the State what we need and re-prioritization of state funding. Your answer was that was you tried and it is hopeless. I beg to differ. I have seen no effort by the city to track and inform the San Leandro public of State efforts that may harm our community with time to organize in opposition, and no effort to support and organize voters in demanding our state representatives do right by us. Your Facebook page reads like an event calendar, not a page to lead us to action. Imagine what would happen if we had a mayor able to inspire voters and encourage other local mayors to do the same. Instead, I have watched as you appear to abdicate more and more leadership to city staff and waive away larger State-oriented efforts as pointless. Lack of mayoral leadership fueled my upset at the recent District 5 and 6 meeting when you ended the meeting despite community members still wanting to speak and city leaders willingness to stay. Regardless of the officially noticed time of the meeting, there was no need to end the meeting at that time, and capacity to continue it. Part of my upset is rooted in a belief that it is beneficial for all our community members and representatives to hear from us all — the group process builds group knowledge and accountability. My upset also was because we in the community had heard nothing from you on your personal leadership, ideas, or concerns around crime or anything else, apart from when I personally asked you to comment on whether you would support a marijuana tax to fund underfunded public safety infrastructure. I wanted all of us voters in attendance to hear from you directly and decide if we should vote for you in 2014. I want to know what you think of the police chief presenting misleading information; I want people in my neighborhood to know what you think is a safety priority and what your solutions are. Ending the meeting as you did, you appeared to remove yourself from any responsibility to lead or respond to your constituency, and instead chose to defer these roles to staff. I am not in favor of our town’s safety policy being conflated with policing and controlled by any Chief or unelected staff person. My concerns for your leadership are compounded when I hear you thank the Chief profusely when she misleads us all, and when she proposes unconstitutional surveillance plans (like the chicken policy provision demanding permit owners submit to searches for any reason and without cause). From what I have seen, your administration is interested in maintaining that deference to staff regardless of the needs of your constituency. I look forward to learning otherwise. Meanwhile, I believe the voting public is increasingly frustrated with politicians who appear disconnected from their base. Last week’s opinion polls in the San Leandro Times are remarkably uniform in this view. Similarly, several district members in attendance spent the one-on-one time discussing how we would rather have district meetings that are called and run by the voters around our needs. I look forward to inviting you to attend such a meeting in my district in the New Year. San Leandro resident Cynthia Chandler posted this open letter today to Mayor Stephen Cassidy‘s Facebook page. Ms Chandler is a professor of law at Golden Gate University. As a survivor of violence and as a resident concerned with public safety and ensuring our city uses its resources wisely, I am concerned that Chief Spagnoli is engaging in hyperbole and misinformation to promote her personal agenda. I am writing to ask you to take action by ensuring police chiefs are not permitted to craft city ordinances (advise, but not craft). Last night at the District 5 & 6 community meeting, Chief Spagnoli reiterated a false statement that I have heard her make before in public — that rising crime in San Leandro is due to early releases of prisoners. Yet, the department’s data presented at the meeting showed no statistically significant rise in crime (and burglary data was not even disaggregated for commercial burglary, which includes shoplifting). And California realignment law does not allow for early release of prisoners. I asked the Chief if she could direct me to a law or reference supporting her claim of early releases occurring under realignment, because as an attorney I am familiar with criminal codes and policy. She sent me to the California Police Chief’s Association website and accused me of being a State propagandist, supporting the State’s laws and agenda. I thought as a peace officer that her job IS to enforce State law, not create her own. And when I went to that website, all links confirmed that there have been no, and there is no provision for, early releases. The Chief made clear to me that she has her own personal agenda in conflict with State law. I also am concerned that she in intentionally working to boost fears among our community to build political support for her own agenda. This agenda was made clear in her inclusion into the recent chicken and bee policy of an arguably unconstitutional clause allowing for cause-less searches of permit holders yards, for any reason. I moved to San Leandro because it offered a safe community. I want to make sure our resources are used wisely and impactfully. Consistent deference to police and the ever increase of the police budget’s portion of the general fund has contributed to our present lack of funding for roads, economic development, and fire also needed for safety. Allowing our codes to be constructed by any police chief presents a conflict of checks and balances over police power. Will you support an ordinance to control police powers by not allowing police to craft our ordinances? Last Monday, the Center for Investigative Reporting issued a report on how women in California prisoners have been coerced into being sterilized so they can no longer have children. The report was based on the work of San Leandro’s own Cynthia Chandler and her organization Justice Now. It seems like something out of a movie about a dystopic future or from Nuremberg Trial transcripts, but it’s not. It’s California in the 21st century. Coerced sterilizations violate some of the most fundamental rights of women: those to physical integrity and to have children and form a family and to . It is unconscionable to know that this has been done until recently – and may be done again – without anyone lifting a finger to stop it. Now, some lawmakers in California are calling for an investigation of the physicians involved. That’s an important first step, and one that other legislators should join. But we need more, the doctors and prisons officials who let this happen need to be held legally accountable and the politicians that supported these measures need to face political accountability. I hope that now that this has come to light, Attorney General Kamala Harris will start her own investigation and that our local lawmakers will join the call for her to do so.